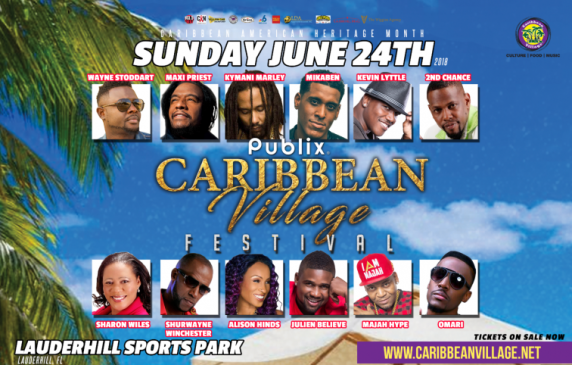 The Caribbean Village Cultural Festival in Lauderhill, FL | June 24th, 2018 - TheUrbanMusicScene.com | Concerts & Festivals! Florida’s Largest Annual Celebration of Caribbean American Heritage Month Features Powerhouse Musical Entertainment, Food, and Family Fun at Broward County Sports Park in Lauderhill. Gates open at 1 p.m.
LAUDERHILL, Fla. – May 21, 2018 – PRLog — Tickets are going fast for Florida’s largest outdoor celebration of Caribbean American Heritage Month with a family-friendly Festival that features the best live Caribbean music, arts, crafts, food tastings, prizes, and an all island-inspired, zesty cook-off competition. This year’s headline musical performers include: International recording artist Maxi Priest along with Kymani Marley; Alison Hinds; Shurwayne Winchester; Julien Believe; MikaBen, and more. “Mr. Comedy” Majah Hype serves as the Festival Emcee and host. This show takes you away on a trip across the Atlantic Ocean and through the Caribbean Sea. Individual food stations at the Festival feature specialties from Jamaica, Trinidad, Haiti, Bahamas and a variety of other islands. An added attraction, sponsored in part by Publix, is a beach party on Saturday, June 23. The Caribbean Village Cultural Festival began four years ago after Lindell Douglas visited the White House and learned the U.S. named June as Caribbean American Heritage Month. Douglas stated he wanted to create an event that would bring awareness to this milestone and celebrate in style. Each year the Festival grows in attendance and star power. The Caribbean Village Cultural Festival kicks off at 1 p.m. at the Broward County Sports Park located at 7500 W. Oakland Park Blvd., Lauderhill, FL 33313 and lasts until gates close at 10 p.m. Proceeds benefit The Galleon Foundation, a South Florida-based non-profit that provides scholarships and student mentoring. Tickets may be purchased on line at https://www.caribbeanvillage.net, or at listed ticket outlets. Also available are tickets for the Beach Party on Saturday, June 23, and the all-inclusive VIP package. For additional information call (754) 209-9928, or e-mail info@caribbeanvillage.net. June was designated Caribbean American Heritage Month and Lindell G. Douglas, a prominent South Florida community leader, envisioned a day of celebration in Broward County. The Festival features some the biggest headline performers of the genre and individual stations feature specialties from Jamaica, Trinidad, Haiti, Bahamas and a variety of other islands. Douglas wanted to create an event that would bring awareness to this milestone and celebrate in style. The Galleon Foundation student scholarships and mentorship programs. The Foundation is a 501(c)(3) located at 300 S Pine Island Road., Ste 3031, Plantation, FL 33324.